Horizon Tech falcon F1 replacement coils, compatible with Falcon tank metal, Falcon Resin tank and Falcon Artisan Tank. Sold as a pack of 3. 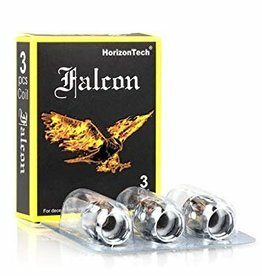 Horizon Tech falcon M - Triple replacement coils, compatible with Falcon tank metal, Falcon Resin tank and Falcon Artisan Tank. Sold as a pack of 3. Horizon Tech falcon M2 replacement coils, compatible with Falcon tank metal, Falcon Resin tank and Falcon Artisan Tank. Sold as a pack of 3. HorizonTech Falcon King sub ohm Tank is the perfectly upgraded version of Falcon tank. After a push of the button, the lid pops out instantly and the tank is ready for refilling! No Need to slide the lid with your hand! 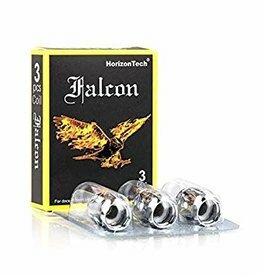 Pack of 3 genuine replacement Horizon Falcon M1+ bamboo fibre mesh coils 0.16Ω Ohm. 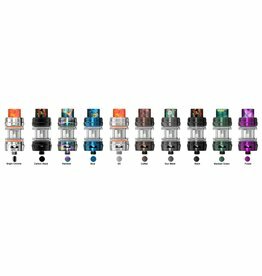 HorizonTech Falcon Mini Metal Tank available in 11 Colours - Blue, Brushed Bronze, Carbon Black, Gunmetal, Orange, Pearl White, Purple, Rainbow, Red, Rose Gold & Stainless Steel. HorizonTech Falcon Mini Resin Tank available in 7 Colours - Black, Blue, Green, Orange, Rainbow, Red & White. HorizonTech Falcon Resin-Artisan Edition Tank available in 6 Colours - Black, Blue, Camo, Crimson, Cyon & Yellow/Green.